Black Ice Software - Print2Email version 10.00 is released! 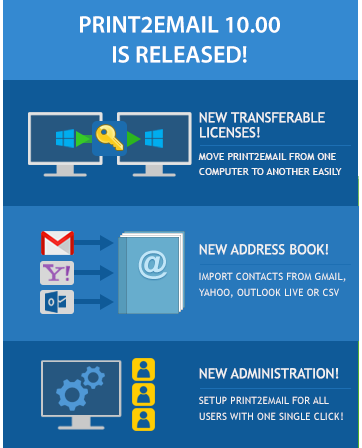 New completely rewritten Print2Email with dozens of new features! Black Ice Software has released version 10.00 of the Print2Email. The new version of Print2Email is completely rewritten and includes dozens of new features to make email sending and document conversion simpler and faster. The New Address Book feature with Gmail, Yahoo, Outlook Live integration includes a new option to import contacts easily from a CSV (comma separated values) file. New transferable licenses, allowing Administrators to easily move the already registered Print2Email to a new computer, or to register the Print2Email with a different serial number without uninstalling the product. New improvements for Administrators to configure the Print2Email settings for All Users on the computer with one single click! This new feature could highly reduce the time of Print2Email configuration on systems with a large number of users. Print2Email 10.00 includes further stability improvements for sending emails with Print2Email using Outlook, and also includes minor improvements on the user interface to enhance user's experience. Change of licensing for Windows Server. No more User licensing. Single license for a servers, with unlimited users on a server. Added Print2Email MSI installer for Windows Servers.